This week is Afternoon Tea Week. Officially. To me, this means that there is hope for civilization in this cruel world. Now, I know that I am not in the UK, the official location of this miraculous event, but I believe with all my tea-sipping, cake-eating, sandwich-nibbling, teapot-adoring soul that geography cannot limit the reach of Official Afternoon Tea Week. And we still have the weekend to partake in tea! With God and the blogosphere as my witness, the heavens may burn, and WordPress may repeatedly overwrite my post with nonsense, but tea will be had, in the afternoon, with dainty snacks! I originally wrote an excellent post about this cake and, as I petulantly mentioned above, WordPress saw fit to over-write it with a jumble of links. 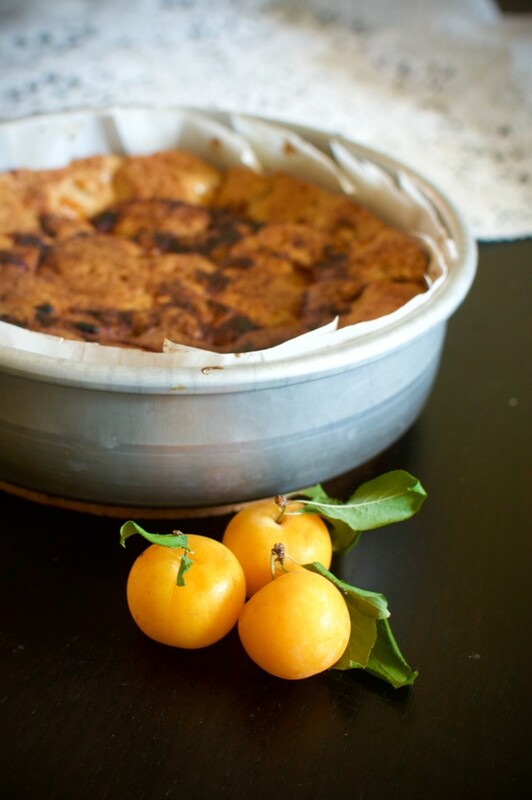 I was witty, and just a tad sentimental about the loveliness of the weather, neighbors, neighbors’ plum trees, and the many lovely ways that I celebrated the Mirabelle plums picked from a neighbor’s tree. But it seems it was not to be. I was not destined to wax lyrical about neighborly generosity, or Mirabelle plum jam, or liqueur. WordPress knew all along that this post and this cake recipe were to honor this auspicious week of our beloved afternoon tea. In the US there is great affection for taking tea as a special occasion. It seems to be treated rather like fine wine or caviar – reserved for a very special event (a bridal shower or Mothers Day), and for the wealthy among us. Now, I am as greedy for fancy things and tea parties in elegant hotels as the next person, but my favorite way to have afternoon tea is less frilly and more frugal. If you have a little time, a teapot, tea, and something to nibble, you have the ingredients for afternoon tea. The most essential of which is time. It is the greatest luxury any of us can hope to afford, and I argue, that it is the element that makes afternoon tea as special as it is. It is indeed special to take time (and tea) to enjoy the afternoon, not to fill our bellies (like lunch or dinner), nor to merely boost our caffeine levels. This cake is the first that I have found that showcases all seasonal fruits beautifully. It never stands in the way of the fruit’s flavors or juices, but supports and elevates them. 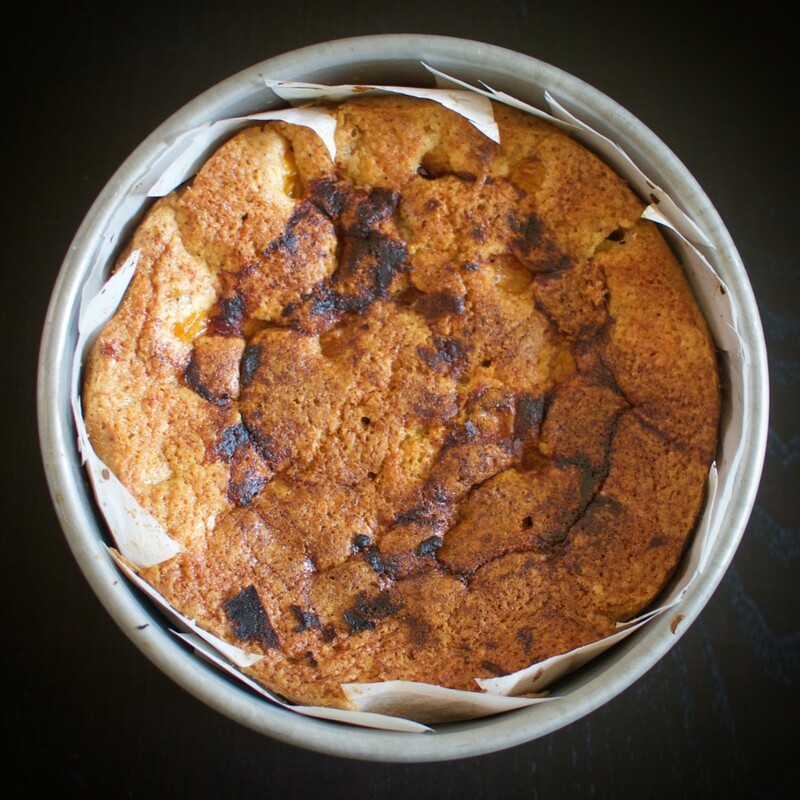 I have a particular love of sturdy but tender cakes, and this fits the bill perfectly. 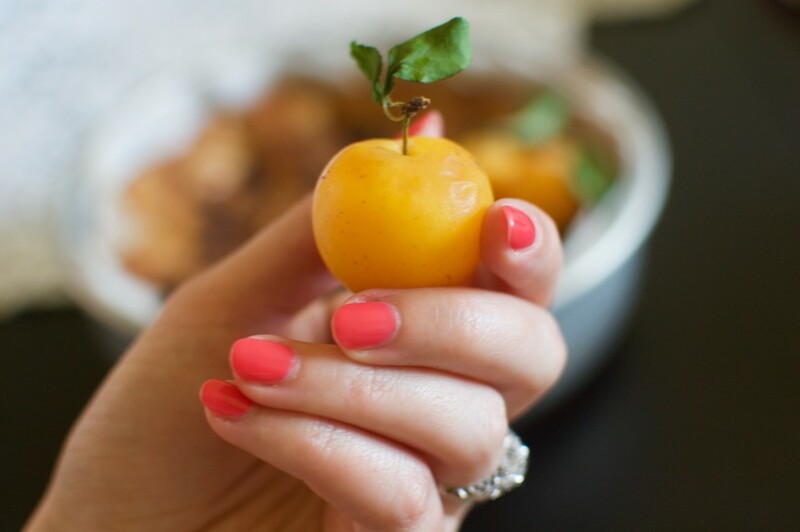 It was divine with my dainty Mirabelle plums – elegant golden French orbs only a little larger than a cherry. I covered the whole surface of the cake with them, and they sank into the batter, suspended happily under the craggy crust. It would be excellent with halved figs, chunks of pear, or plump blackberries. The batter is very thick and fragrant with cinnamon and cardamom, and it infinitely versatile. Lemon or orange zest and cognac would be welcome, as would the flavor and charming speckles of vanilla bean. So whip up some cake and brew some tea! Spend some time appreciating the day in good company. Preheat oven to 350°F (176°C). If you do not have a springform pan, grease your 8-9 inch (20-23 cm) round pan and line the bottom with parchment paper. 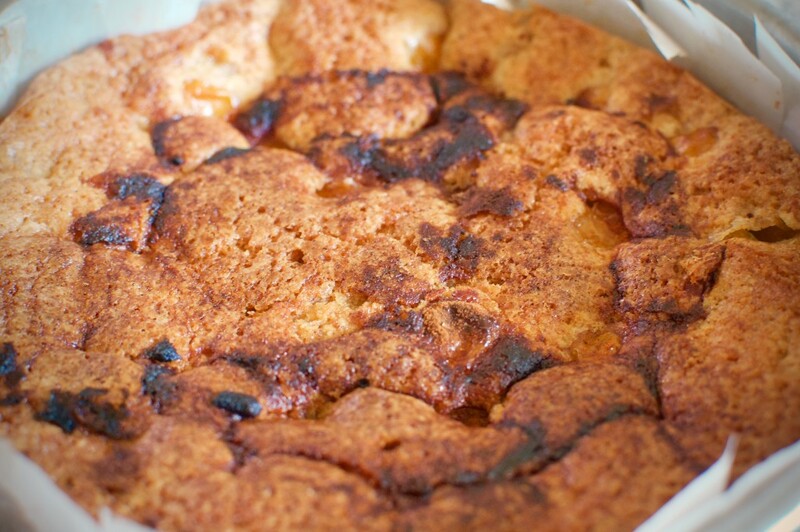 In a medium bowl, sift or whisk together flour, baking powder, salt, 1 teaspoon ground cinnamon, and 1 teaspoon cardamom. In a larger bowl, or in the bowl of a stand mixer with a paddle/scrapper attachment, cream butter and 1 cup sugar until light, fluffy, and well combined. Add eggs, one at a time, mixing after each until fully incorporated, and scrapping down the sides. Add the dry ingredients and mix until just combined. The batter will be very thick. Spoon batter into your pan and smooth the top. Arrange the plums, skin side up, all over the batter, covering it, gently pressing them into the batter. Sprinkle the top with lemon juice, then cinnamon, then turbinado sugar. Serve the cake just a little warm or at room temperature, with tea and whipped or double cream. It keeps well for at least two day, though caramelized crusty top becomes softer. The original recipe is called a torte, but I found it to be remarkably cake-like, this may have been because I used an 8 inch (20cm) round pan instead of a 9 inch (23cm) springform pan. I found with proper pan preparation, the cake turns out easily and cleanly. In the photos, I lined the entire pan with parchment paper. The method I used in subsequent batches (greasing the pan and lining just the bottom with parchment paper) is far superior. Recipes Cake, Dairy, Dessert, Plum, Tea! So true, Alanna! I’m hoping to try out a new tearoom in Berkeley. I’m all for tea at home, but a good tearoom can’t be beat!